Click on thumbnail above for larger view of color chart. This color chart refers to new poured concrete - stamped, countertops, etc. 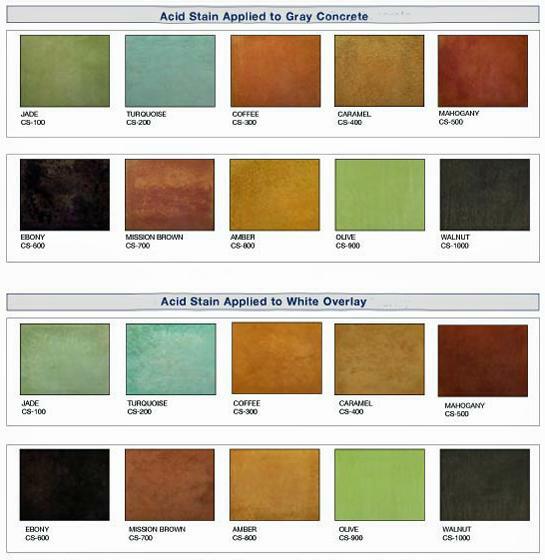 This color chart refers to Acid Stained concrete - overlays, stamped, countertops, etc. Color selection is usually the hardest decision our clients have to make. This is our preferred color spectrum chart. In the industry, color manufacturers all have similar colors. Some vary only by a shade or two. If a color shown above is 'almost' right, we can discuss colors available from other manufacturers, and will provide you with the appropriate color chart. Let us know the color shown above that is closest to your preference. Also, with enough notice we can provide a sample custom made to your specifications. Also, these colors may not apply to your project! Contact us for project-specific color charts and samples.